The Soul Pilots: What Is This All About? In this world today, there are a very few people who choose to travel across the veil. Their purpose and their mission is to save lost souls. 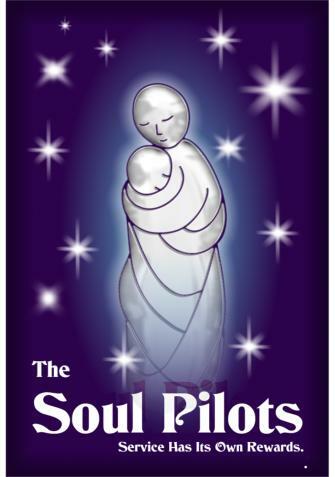 They are the Soul Pilots. I look at the group and there is one, an old woman with long white hair, wrapped in many furs, and she has a crude blue star painted on her forehead. She looks up, looks around and then she sees me. She places one hand each on their heads, and as she does this, a transformation occurs - a rippling goes through the children head to toe and they change from the wild things they were into children of these people, well fed, their rags transformed to clean, fresh skins and their hair in braids, and a blue star on their brows just the same. All three are smiling, and the old woman places a hand on the shoulders of the children, as they help her back to her place in the circle, and sit down next to her on either side as well. These are stories like you've never heard before. Stories to enrich your life, told in simple words by honest men and women from around the World. Read these beautiful stories and let them enrich you, uplift you and inspire you. Each one is unique, each one unheard of, each one a treasure and a triumph of love and human compassion - service has its own rewards. Many Journeys Into Pure Magic, Healing and Enchantment. "This is without a doubt, THE most interesting and unusual book I have ever read. " Wonderful energies, so moving, so nourishing! I wanted more, and more. "All hail to the Soul Pilots!" Order Now - The Most Unusual Book You'll Ever Own.